Today’s Bonus Offer Highlight is an extension of an offer that was supposed to end on Dec 31 and Jun 30 before that so it really seems to be an ‘ongoing’ offer despite the terms stating an expiry date. 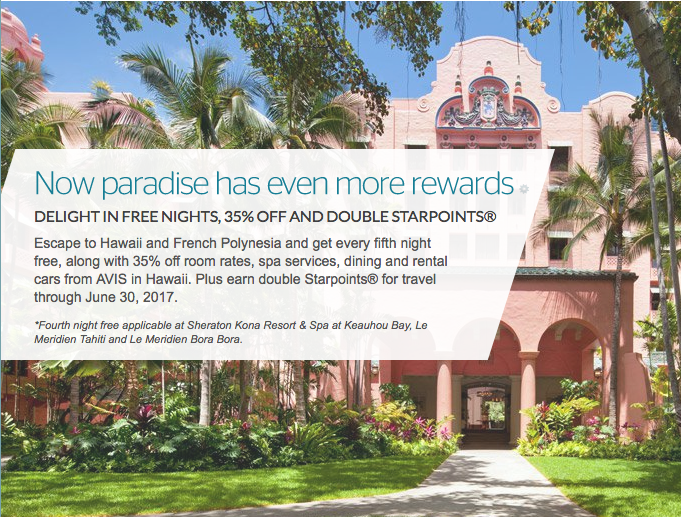 The offer is SPG’s Double Starpoints, up to 35% off and 5th night for stays in Hawaii. Depending on the hotel and time of year it can provide some decent savings over regular rates not to mention the Double Starpoints that you get! Other bonuses to check out are the American AAdvantage Transatlantic bonus, Hilton’s buy points bonus and the extension of all of Hilton’s targeted winback bonuses.